The University of Virginia football program hosts No. 16 Miami this Saturday evening (October 13) in Scott Stadium. Earlier in the day, the Virginia men’s and women’s basketball programs will hold their annual Pepsi Blue-White scrimmages. All three programs will also be busy on the recruiting front as well, with each hosting recruits on official and unofficial visits. Four prospects, including two uncommitted high school seniors and two Virginia commits, are expected on Grounds this weekend on official visits. The two committed prospects are speed-burner H-back Seneca Milledge and defensive back Major Williams, who both hail from Dunbar High School in Fort Myers, Florida. Their teammate and classmate, Florida State “commit” Derick Hunter, was reportedly planning on joining them, but that no longer appears to be the case according to this report from 247Sports’ Texas A&M site. Hunter has not publicly de-committed from the Noles, but he is taking official visits to other schools, including one last weekend to Texas A&M. If anything changes with respect to this weekend, we’ll let you know. 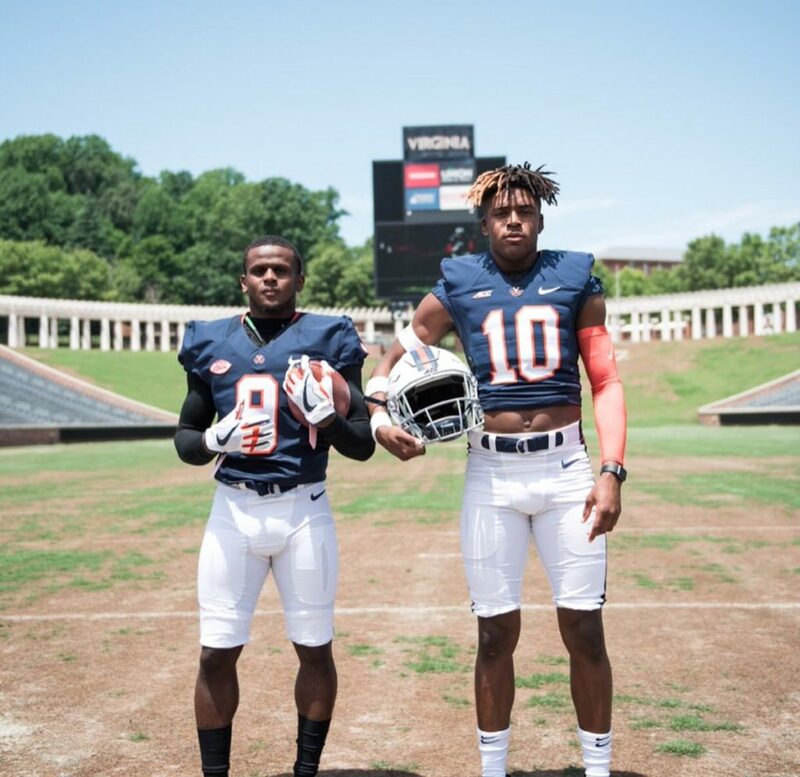 Edna Karr (New Orleans, LA) cornerback Devin Bush and Lovett School (Atlanta, GA) linebacker Nick Jackson are the two uncommitted class of 2019 prospects expected at UVA on officials. Bush confirmed his plans via Twitter on Wednesday (October 10). Per 247Sports, Bush is scheduled to take an official visit to Arkansas next month. The 4-star senior boasts offers from Arkansas and Virginia, among many others. Duke, Northwestern and Virginia are among the schools 6’2”, 225-pound Nick Jackson is considering. Jackson, whose father is a UVA graduate, has visited Charlottesville numerous times already. He told TheSabre.com in an earlier interview that he wanted to make a college choice around the start of his senior season. That obviously has not happened, and as of now there is no known timetable for his commitment. Jackson was at Duke the last weekend in September and called the experience “great” in this tweet. Virginia boasts 19 verbal commitments in its class of 2019. There are four potential linebackers already committed, and two likely cornerbacks (the aforementioned Major Williams being one). In addition to the official visitors, look for a large turnout of recruits to be in Charlottesville Saturday night to see the Hoos take on Miami. Here is a rundown of those other players who we know plan to be in Scott Stadium, and we’ll post all those we confirm directly over the weekend (either Saturday or Sunday). Five-star wing Johnny Juzang, a 6’6” junior out of Harvard-Westlake (Los Angeles, CA), is on an official visit at Virginia this weekend. The sweet-shooting prospect was offered a scholarship by head coach Tony Bennett his past summer. Whether or not Virginia will ultimately be able to sign Juzang remains to be seen, but the first step is getting a visit, which Bennett & company have done. 📽️ #USABJNT Minicamp: @KP_Rivals chats with 2020 5-star Johnny Juzang, who has seen his recruitment pick up. @JohnnyJuzang discusses #UVA, #BBN, #Marquette, #UCLA, #USC, #Cal & #GoBuffs. Also planning to be in Charlottesville this weekend is Trinity Episcopal (Richmond, VA) combo forward Henry Coleman III. Coleman III, a junior, will be on Grounds for an unofficial visit on Saturday, when Virginia holds its Pepsi Blue-White scrimmage. Virginia offered the in-state standout this past summer. This is the latest of many trips Coleman III has made to UVA, which is his mother’s alma mater. He has taken unofficials to Maryland, Pittsburgh, Virginia Tech and West Virginia within the past few months. Coleman III traveled to Blacksburg last Saturday to see his father’s alma mater, Virginia Tech. UVA currently has three open scholarship spots in the class of 2020. The Hoos have zero commitments in the class. Juzang is the second high school junior to take an official visit to UVA, which hosted Gonzaga (Washington, D.C.) combo forward Terrance Williams last month. On the women’s hoops front, first year head coach Tina Thompson will host class of 2019 point guard prospect Shemera Williams on an official visit this weekend. Williams, a native of Milwaukee (WI) lists a final six of DePaul, Kansas State, Kentucky, Marquette, Missouri and UVA. She took an official visit to Marquette the weekend of September 21-23. The 5’7” senior is rated a 4-star prospect and the No. 54 player in her class by ESPN.com. Follow TheSabre.com on Facebook and Twitter.